The perfect example of how a venemous mind is reflected in the windows to the soul. It is also a reminder of how cruelty is often the result of inner turmoil, shown in this as a physical wound. “Eye contact can be uncomfortable because it can reach into the depths of the soul and reveal the unknown. 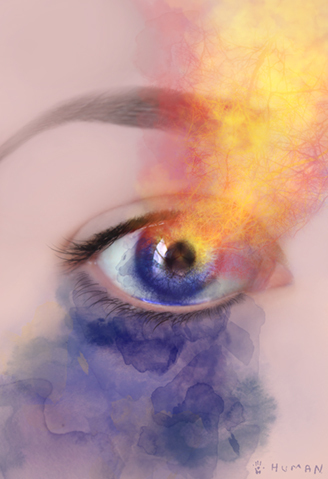 I like to explore the imaginary world behind a passing glance through my study of photomanipulation, especially surreal photo manipulation of eyes. My art is influenced and inspired by emotions from my childhood and by the feelings I experience daily when I make eye contact with strangers. Divergent is a chic piece of wall art exploring the juxtaposition of geometric design with organic plant life in shades of emrald green, peacock blue, and lavender with highlights of gold. 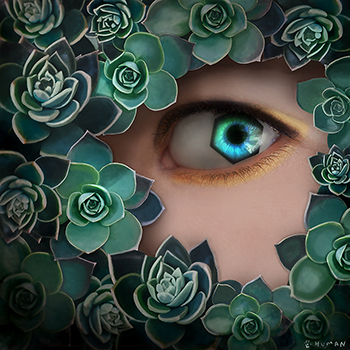 This work of digital art embraces the trendy structure of succulent plants and transforms them with an alluring and oddly angular eye in a way that complements a living room wall. 2. To unite so as to form one mass, community, etc. 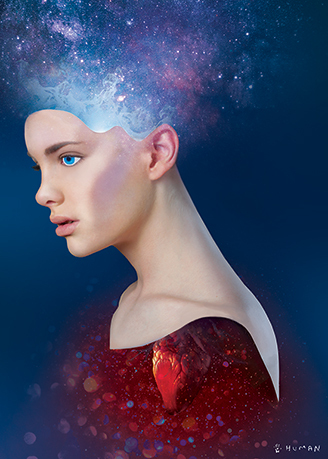 This surreal digital artwork explores the beauty of imagination that stems from the heart. This cool photomanipulation captures coalescence of heart and mind in a galaxy of thought. This fine art poster will add beauty and elegance to your home or office.